First Ulahn troops appeared in Saxon army in 1730, when two companies of Polish-style light horses were raised, each of about 120 men ((2) and (4)). Uhlan from Red Company and officer from Blue. Illustration from (2). Uhlans were dressed in Polish-styled white coats with lining, breeches and undercoat in companies color: red and blue. They were armed with a sabre, pike with red-white or white-blue vane and a pare of pistols. Some Uhlans had Tartarian bows. Uhlan troops were on intermediate state and did not belonged either to the Saxon regular army or to the army of the Polish-Lithuanian Commonwealth. I believe, that they were irregular troops on Saxon service. They stationed in Poland and were used for patrol and courier duties. During the war of Polish Succession 1733-35 Uhlans stayed loyal to the Wettin dynasty in contrast to the most of Polish-Lithuanian armed forces. Schuster and Francke mentioned that during the campaign of 1734 2 Fahnen of Polish light horses acted with Chevaulegers under lieutenant-colonel count Bitum (evidently later Prinz Karl Chevaulegers) (4). After the end of hostilities in 1735 the Uhlan troops survived and their number was increased. Jahns wrote that by 1740 Saxon army included 7 Fahnens of Uhlans, each was of 3 officers, 34 Towarczys (a knight or noble) and 34 Pocztowi (knecht or private) (3), while Schuster and Francke give the strength of Saxon Uhlans in 1740 of 12 fahnen under the command of Colonel von Bledowsky (4). On 1 Jan 1741 a 13th fahnen was added, on 1 May 1741 a 14th and 15th fahnen (4) (after (3) only 14 in 1741). Evidently they operated together under common command of colonel Bledowsky (Blentowski, Belwedowski) because Tessin shows them in 1740-42 as a single regiment (6). Schuster and Francke wrote that each man of a Uhlan Fahne received for his armament a pictol and cartridge box, every common Uhlan also received a carbine. Each individual was responsible for providing is own sabre and lance. The uniform in about 1740 was white with blue facings. The Uhlans were especially recruited in Lithuania and from Tartars. During peacetime they were used to secure the roads between Saxony and Warsaw, and to occupy the Salt Work at Wieliczka, and at the same time used with regular Saxon Cheveauxleger Regiments. The staff of a Uhlan Fahne in the Fall of 1741 from Schuster and Francke differs a little from Jan's one: 1 Rittmeister, 1 Lieutenant, 1 Cornet, 1 Kettledrummer, each with a Pocztowi (private), 46 Towarczys (Polish nobles), 46 Pocztowi (privates), together 100 men (4) . Uhlans evidently operated with Saxon army as a recognize troops during the 1st Silesian war and in March 1743 they returned to Poland where their number was increased to a total of 23 fahnen ((3) and (4)). They were reorganized in three Pulk (regiments in Polish) under Colonels Bledowsky, Sychodzinsky and Wilczewsky, the first two from the original 15 fahnen and the latter from the newly created 8 fahnen (4). Tessin (6) wrote that Sychodzinsky and Wilczewsky (Wilozewsky after Tessin) were created in 1742 so it is possible that reorganization of Uhlans was started in 1742 and completed only next year when new fahnen and recruits were added. At the end of September 1744 3 Pulks of Uhlans (Wilczewsky, Bledowsky and Sychodzinsky) were departed for Saxony from Poland and on 2 October 1744 joined the Main army at Adorf. The fresh-created Ulan Pulk followed them in winter 1745 and on 17 May 1745 there were 4 Uhlan pulks with the Saxon Army that entered Silesia with the Austrians: Bertuszewsky of 6 fahnen, Rudnicki, Ulan and Boreslav each of 8 fahnen. The Battle Order of the Saxon army in October 1745 includes 4 Uhlan's pulks: Belwedowski, Ulan, Rudnicki and Bertuszewski (4). Did Belwedowski change Boreslav or it is the same unit I do not know. The same 4 regiments are shown in the Saxon BO at Kesselsdorf on December 15, 1745 under command of v. Sybilsky (4). After the defeat at Kesselsdorf Saxony left the WAS and about post-war development of Uhlan troops we know a little. In the middle of January 1746 they returned to Poland and Tessin wrote that 3 Uhlan regiments were disbanded in same year (6) while the "Plan der Koniglich Polnischen Kursachsichen Armee 1747" still mentioned in 1747 six so-called "Tartarische Fahnen" stationed in Poland and totaled 5 400 (5). Evidently 3 Uhlan Pulks were disbanded shortly after the Saxony left the WAS but exact date is unclear. On 1 June 1754 August had 3 Pulks of Uhlans: Wilczewsky, Rudnicki and Bronikowsky (4). By the start of the 7YW all of them stayed in Poland and did not participated in the Pirna campaign. 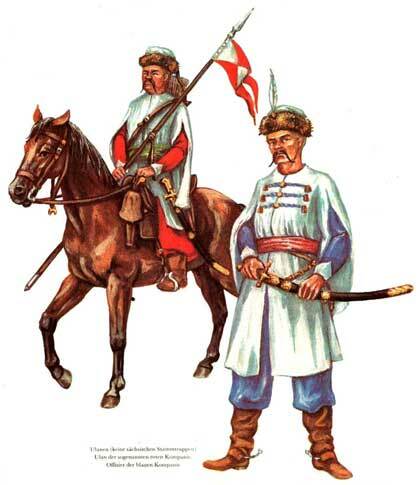 When Saxon army was rebuilt in exile, two Pulks joined them in Hungary and operated with them in 1757-62. About 1757 Renard Uhlanen and Rudnicki Uhlanen were with a strength of 603 and 602 men respectively and 575 horses each (4). They took part in several campaigns including Kolin. Wilzewsky Uhlans stayed in Poland the whole war and did not participated in any actions. Red Pulk. Black middlehigh furcap. White overcloth with very wide and long sleeves. A little, low red upstanding collar, red turnbacks and red lining. On the collar red-white laces and the same lace on the breast where was on the right side (of the middle) 4 x 2 gilded buttons. On the turnbacks which reached halfway down the thighs were in the same red-white lace the crowned AR. Red waistcoat with red-white lacing along edges. Red baggy trousers reaching to the ankles. White-red sash. Blue Pulk. As the red pulk, just change red with blue. Buttons silver. Sash red-white. The laces in 1-2-3. Very curved sabre in black scabbard. Brass handle and fittings. Black boots without spurs. It is known that the pulks had brass kettle drums. Their standards were with a white cross on and the squares red or blue, on the pole a gilded button. After the death of the August II in 1763 his successor Frederick August could not achieve the Polish Crown and shortly after this Uhlan regiments were disbanded. The lineage of Saxon Uhlan regiments is unclear and I could not rebuild it. Various sources give different variants of the Uhlans development and transcriptions of the colonel's names. 1740 Bledowsky Uhlanen, 1746 disbanded. 1742/1 Sychodzinsky Uhlanen, -1745 Boreslaw, 1746 disbanded. 1743 Ulan Uhlanen, 1750 Bronikowski, 1757 Renard, 1759 Schiebel 1763 disbanded. 1745/1 Rudnicki Uhlanen, 1763 disbanded. 1745/2 Bertuszewsky Uhlanen, 1766 disbanded. 1 . Friedrich F. Die Uniformen der Kurfurstlich Sachsischen Armee 1863-1763. Dresden. 1998. 2 . Muller R., Friedrich D. & W. Die Armee Augustus der Starke. Berlin. 1984. 3 . Jahns Max. Geschichte der Kriegswissen schaften vornehmlich in Deutschland. Munchen-Leipzig: Verl. von Oldenbourg, 1891. (A copy is available from the Library of the Tomsk University, Russia). 4 . Schuster O., Francke F. Geschichte der Sachsischen Armee. Leipzig. 1885. 5 . Plan der Koniglich Polnischen Kursachsichen Armee 1747, published in "Zeitschirft fur Heereskunde" # 165 (Sept./Oct. 1959). 6 . Tessin G. Die Regimenter der Europaischen Staaten im Ancien regime des XVI. bis XVIII. Jahrhundrets. 7 . Die Heer der kriegfuhrenden Staaten 1756 - 1763, KLIO-Landesgruppe Baden-Wurtemberg, 1989.